Honestly, it’s the cover that truly caught my eye. The art style reminded me of Kings of the Wyld (it might even be the same artist? I honestly have no idea and can’t figure it out online, so if it is, would someone mind letting me know so I can credit them?) but I can’t get enough of that grunge mixed in with the blue color scheme. So you can image how happy I was when I read the blurb and it sounded just as wonderful as this cover suggests. So much so, now it’s one of my most anticipated reads of 2019. Yes!!! 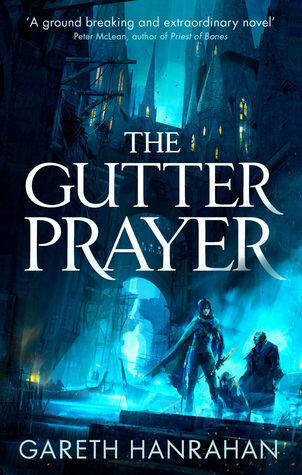 And the cover artist, Richard Anderson is indeed the same as the one who did Kings of the Wyld, Bloody Rose, and many other gorgeous books such as Staveley’s Chronicle of the Unhewn Throne series. YES, thank you! I thought it was the same artist who did both Eames’ and Staveley’s work, but I couldn’t figure it out. Thank you so much, Petrik, for confirming that *and* giving me a name to dream having my own covers done by one day. This is a debut novel? Sounds ambitious! Yes, the cover art is spectacular. I believe it is! I can’t wait to read it and see if it lives up to the hype (though I’m betting it does). I was so excited to get an ARC of this, I’ve been hearing great things in early reviews already! Jealous of you on that count, that’s fantastic!! I have heard good things too, though, you’re right, which only increases my excitement! Thank you so much, Tammy. I dunno how Google failed me in helping me figure that out. Seriously can’t wait to read this one.